Nike dropped something of a renewable energy bombshell last week, just as President Trump was gearing up to celebrate his first year in office. The leading global athletic wear company announced a huge 86-megawatt deal that throws the force of Texas wind power behind its pledge to bring 100 percent of its North American operations into the renewables fold by 2025 -- seven years earlier than planned. Talk about raining on the fossil fuel parade! All during his successful campaign for the Oval Office in 2016, Trump convinced coal miners and coal communities that he would revive the coal industry. However, facts on the ground continue to demonstrate that the renewable energy transition is inevitable. An agreement to buy power from a planned Avangrid Renewables wind farm in Texas will take Nike Inc. to 100 percent renewable energy for its North American operations, the company said Thursday. 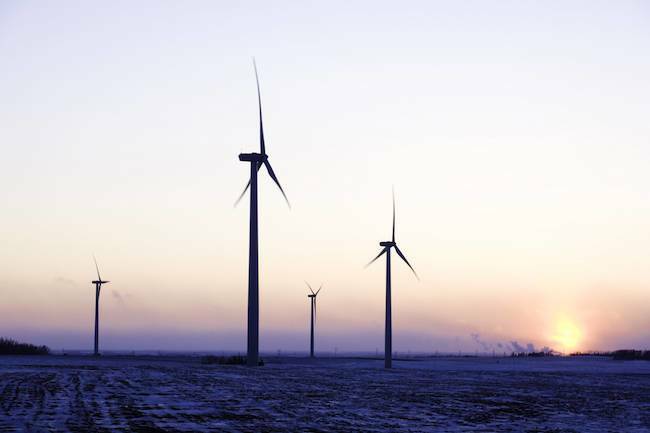 Nike's new wind power deal consists of an 86-megwatt power purchase agreement for the Karankawa Wind Farm in Texas, which is a 286 megawatt project developed by Portland-based Avangrid Renewables. Even with the 2025 goal in hand Nike still has global manufacturing supply chain issues to resolve, but the company has developed a strong sustainability profile that includes materials innovation, advanced manufacturing, water conservation and green chemistry pathways among other steps. Last year, Avangrid Renewables completed work on what is now Oregon’s biggest solar power plant, with the power going to Apple Inc., and began construction of an Oregon wind farm that will also deliver power to Apple. It also began providing energy to Amazon Web Services from a new North Carolina wind farm, and announced a deal with Google for power from two planned South Dakota wind farms. That's just one small example of a much broader trend tracked by TriplePundit among many other media organizations. Aside from the advantage of green branding, one good argument for renewable energy is the stability of energy expenses -- after all, once the solar panels or wind turbines are installed, the fuel is essentially free. With the advent of advanced energy storage, reliability of supply is another bottom line factor in the plus column for renewables. More recently, wind and solar costs have dropped so low that they are competing on price in some markets, too. In another bad sign for US coal, the International Renewable Energy Agency (IRENA) foresees price parity globally between renewables and fossil fuels by 2020. The report highlights that onshore wind is now routinely commissioned for USD 4 cents per kWh. The current cost spectrum for fossil fuel power generation ranges from USD 5-17 cents per kWh. Here in the U.S., renewable energy stakeholders got some good news when the Federal Energy Regulatory Commission gave a thumbs-down to a Trump administration proposal that would have protected uneconomical coal and nuclear power plants. That proposal came from the Energy Secretary Rick Perry, but it looks like a case of 'do what I say, not what I do.' While Perry has been toeing the Trump line in some regards, the Department of Energy has been vigorously promoting the U.S. wind industry all year long. The Interior Department also has a hand in the renewable energy mix. Interior Secretary Ryan Zinke has come in for his share of criticism on every side from Hurricane Maria grid recovery to drilling on public lands, but his agency has moved forward on offshore wind energy leases. Photo: Avangrid wind farm in South Dakota.